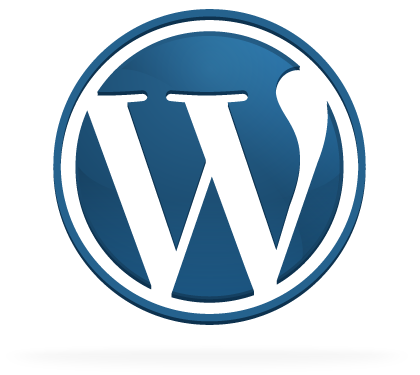 If you have looked around in your hosting control panel you might have noticed a logs section area. The availability varies from one host to the next, but Awstats and Webalizer are both fairly common, and usually available. You might even find Analog stats, which is basically text based stats without the pretty pictures and graphs. Both Awstats and Webalizer are fairly decent. However, depending on what you are analyzing they may not be so accurate or useful. For instance the number of unique visitors, number of visits, pages, and hits will always be larger in Awstats when compared to Google Analytics . This is because your web hosting server is counting all traffic including bots, even annoying bogus traffic. 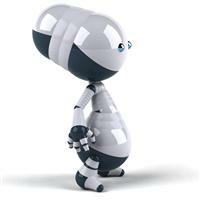 Note viewed traffic includes traffic generated by robots, worms, or replies with special HTTP status codes. And, believe me some sites get a lot of bot traffic. These are not my stats by the way. They are just some samples I am using for reference. Each and every site is different, but you might expect 60%-90% of the numbers reported in AWsats to be bots. So if Awstats says 1000 unique visitors for the month most likely it is more like 100-400 real visitors. If you had 2000 visitors in Awstats it might be more along the lines of 200-800. 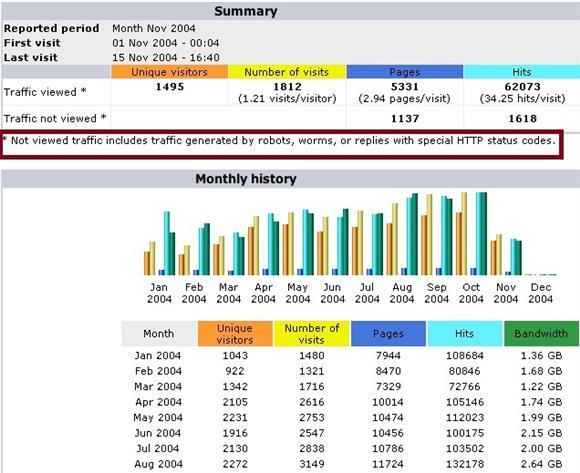 You can also compare your daily or monthly visitors, pageviews, etc. in Google Analytics to Awstats. When doing so you can usually get a fairly good idea of what percentage are bot visits. For example if Google Analytics reports 10,000 unique visitors, and Awstats says around 100,000 you would have a high amount of bot traffic or around 90%. Again, these are not my stats. They are just some samples I am using for reference. 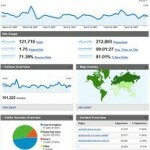 Awstats does provide great statistics and it can be very helpful. I just wouldn’t get too excited when you see the numbers it reports until you compare them to Google Analytics to get a better understanding of what the number of real visitors are. If you don’t have a Google Analytics yet head on over there and get started. I always wondered why the discrepancies between stats software. Now, instead of just touting Awstats and google as over-inflated and inaccurate ways to read traffic, I can pick the info I need out of them and then rely on GA for the rest of my numbers. 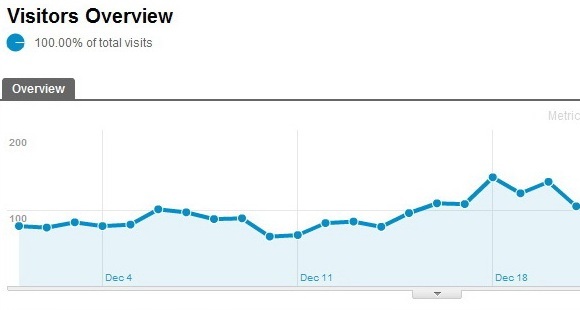 No doubt that Google Analytics is best for measuring the traffic as it does not record bot visits but AW stats does……. I think it’s always a wise move to use Google analytic to check your traffic stats. If there is a huge difference between the two then you might want to find out why so many bots are attracted to you website. I used a service that tracks bot activity for a while and it was amazing how much traffic was actually bot related. Not that they are all bad or anything, but there was more than I realized. It’s funny how software which are all suppose to do the same job ends up with different findings. I use statcounter and it’s outcome is also likely to vary from analytics and awstats. It is amazing how various statistics and tracking things can vary from one to the next. It’s like you don’t really know which one is right or more accurate. I do look at Awstats once in a while, but I rely on Google Analytics the most. i think Google Analytic is better. Google Analytics provides many educational resources. Whether you’re new to analytics or an experienced user you’ll find videos and articles to help you get the most out of Google Analytics. I never know Awstats is not trustworthy and the actual visit is so low compare to what it stated. By the way, Google Analytics look too complicated to me. It really depends on what you are trying to analyze in Awstats. Some of it can be helpful. Google Analytics looks complicated, but it’s really pretty simple. You don’t have to comb through each and every detail in the reports. Just a few menu’s will provide a good insight in to where your traffic is coming from and what they happen to be viewing. I hate that our reports in our hosting service have all of these false hits Ray so I’m wondering why they don’t improve this. I mean for goodness sakes, don’t they want to have the most up to date information for their “paying” customers! Google’s free but I’m not knocking it. I appreciate you bringing this up because most people don’t pay attention to what’s underneath in small letters. I just rely on Google. I am not a big fan of Google products or services, but I believe Google Analytics is much more accurate than a lot of the alternatives out there. Awstats has been around for a very long time. So has Webalizer come to think of it. Back in the early day they were more accurate because we didn’t have all these automatic bots, spammers, proxies, and such like we do now. I have been to sites where people will post their Awstats or Webalizer visitor numbers probably because they are usually bigger numbers than what you would find in Google Analytics. So I guess it looks better. The problem with that is a lot of those visits are bots. Sure they actually visited, but they aren’t real people. Maybe they don’t realize it. I mean if Googlebot visited 10,000 times or more in a given month I don’t think that should really count as part of my visitor traffic. Thanks for clarifying the reason for the discrepancy in our available stats, although as a Hostgator user with quite a few sites it has become a moot point. Once you get over a specific number of sites, Hostgator will disable Awstats reporting for your hosting account. Like you I am not a fan of Google’s services due to their habit of closing or deprecating them without notice. But with clients paying several thousand $ per month for their premium option, Google Analytics will be here for the foreseeable future and free as long as we continue to share our data with them. I have never heard of a host disabling Awstats for having too many sites. I know sometimes a host will turn off analog stats because it’s not used that much. 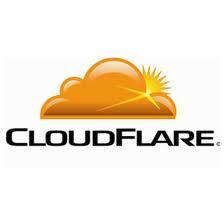 Others will enable only Webalizer or Awstats. They do use some server resources although I couldn’t tell you exactly how much. I do like Google Analytics, but I sometimes wonder if they use our data to their benefit somehow. 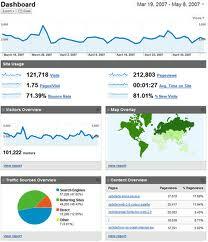 for me google analytic is better than Awastats .Google Analytics provides many educational resources. Whether you’re new to analytics or an experienced user you’ll find videos and articles to help you get the most out of Google Analytics. Thank you for imparting this detailed and well-discussed comparative analysis about Awstats and Google Analytics.